Cocoa Beach is Orlando's Closest Ocean Beach! Top choice Guide for when traveling with kids in FL- includes rankings of best beaches for kids + emphasis on activities and places of interest for kids. See Florida Cocoa Beaches and Satellite Beaches Day Trip Info at our Why Florida Vacation Beaches page. Below is a partial Attraction and Points of Interest list for the Eastern Florida Vacation Beaches Area. Also see local Airport Tip below. NASA - Kennedy Space Center - (AKA: Cape Canaveral Space Center) about 25 minutes north of Cocoa Beach on SR 405 - Can see and hear launches go off at the Cape from your Condo balcony or the beach. I-Max movies, and added to the bus tour if you haven't been there for a few years. Interesting and educational Florida Cocoa beaches attraction. Cape Kennedy - 363 foot long Saturn V Rocket is laid out horizontally with stages seperated for viewing in huge newer NASA Apollo/Saturn V Exhibit Center. Firing room Theater simulates the earth shaking during a rocket launch. Can watch film of original walk on the moon. Bus Tours usually depart every 15 Min during open hours. Standard Admission includes Bus Shuttle Tours to some restricted areas and all Exhibits + IMAX films. Discount for Kids (Can purchase NASA "Close Up" Tour for additional fee) Allow 5-6 hours. Still leaves some time to spend on the Beach when you get back! OR - Check out nearby Merrit Island National Wildlife Refuge (see below) just north of the Cape Kennedy Complex. Interesting and Educational Florida Cocoa beaches attraction. Brevard County Zoo - 8225 N. Wickham Road (on road over to I-95 on way to Orlando - see Map Tip below.) - Interesting large outdoor Zoo built partly over a Swamp so you walk on shaded boardwalks above alligators, giant anteaters, Florida panthers, and other wildlife below. About 500 animals. Have a "Paws-on" interactive learning area and petting zoo for children. Have an Australia exhibit with kangaroos plus a large free-flight bird aviary where some birds can be hand fed. Fun and educational Family Florida Cocoa beaches attraction for all ages. Share your own Cocoa Beach Area Favorite Attraction Comments, "Rave," or "Review" on This Favorite Cocoa Beach Attraction Page. You Might be a Winner in the Contest! Short guided kayak tours are available or may do 4 hour guided kayak "eco-tour" of Indian river Lagoon. Allow 2-3 hours. Usually open daily for tours. Tip AAA members get a discount - have to ask! Port Canaveral - Just north of Cocoa Beach, Florida (Also called the Cocoa Beach Port) - Now a major port for several Cruise Ship lines. Disney usually has one or wto of it's line docked here at Florida Cocoa Beaches plus Carnival, Royal Caribbean, and Norwegian Cruise Lines. Fun to watch them pull out or in. Can even go on a Cocoa Beach Gambling Cruise if you have a yearning to part with some cash on your Florida Cocoa Beaches Getaway. 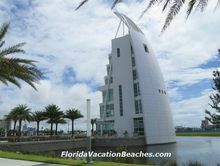 Don't miss the Top Pick "on the water" Cocoa Beach Port Restaurants below plus a tour of the new seven story "Exploration Tower" at the entrance to Port Canaveral! This link goes to a Google Local Aerial Satellite "Hybrid" map of general north Cocoa Beach and Port Canaveral, Florida area with a Street Map superimposed. Port Canaveral is in upper right of map shown. Double click on map to center it to that point - click "+" to zoom in on area. Useful and Fun! There are some great waterfront restaurant choices at the Cape Canaveral Port (AKA: Cocoa Beach Port) area. 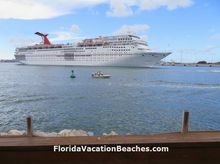 You can watch the big and small ships come an go as you have a restful lunch at Grills Seafood Deck and Tiki Bar, Fishlips, or Millikens Reef Restaurant 2nd floor covered dining deck in the port side two blocks on Glen Cheek Drive in Port Canaveral west of Grills. To more Grills Seafood Restaurant, Fishlips, and Millikens Reef Harborfront Restaurant Info. They are all waterfront restaurants in Port Canaveral, FL on the north edge of Cocoa beach - about 10 minutes drive north from the "Ron John Surf Shop corner" on A1A. More on both Grills and Millikens Reef Restaurants, as well as others of our favorite Oceanfront and Riverfront "On the Water" Restaurants on our new Cocoa Beach Restaurant Top Pick page. Or see our Almost " Free " Time Share Vacations - Getaways with Time Share Resort Tours "price" page. Cocoa Beach Pier - 401 Meade Avenue off of A1A - Approximately 1/2 Mile North of 520 - 800 foot long fishing pier high above the water with many restaurants, bars, rentals, and shops plus beach access. Always a lot of activity at the Cocoa Beach Pier. Exploration Tower at Port Canaveral - 670 Dave Nisbet Drive at the entrance to Port Canaveral, Florida off of A1A. Very distinctive new seven story attraction with seven floors of interesting Port Canaveral History and Information exhibits with many Pictures and interactive activites plus indoor and outdoor observation decks with spectacular views of the Port Canaveral Harbor area. More on the new Port Canaveral Exploration Tower Attraction just north of Cocoa Beach, Florida + a slideshow and Info at this Exploration Tower at Port Canaveral page. 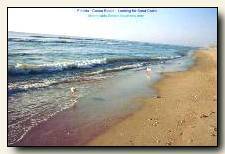 Cocoa Beach Webcams - Want to see what the beaches and surf really look like before you go? Check out our our Cocoa Beach Web Cams page - some of our Top Pick favorite Cocoa Beach Webcams. Includes two "controllable" Live Interactive web cams where you can point and zoom the camera in Cocoa Beach Florida from your computer. Fun to view - about as close as you can get to being there! Merrit Island National Wildlife Refuge. 140,000 acre eco-tourism refuge. At north end of Kennedy Space Center complex. Take Hwy #1 up to #406 over to #402 to Merritt Island Refuge Visitor Center. (See handy Map Tip below.) Four Nature Trails of varying length. Tip Take the 6 mile Black Point Wildlife driving trail with marked stops along the way. Get driving trail guide at Visitor Center. Inteesting and educational Forida Cocoa beaches area. Shopping in historic area of town of Cocoa Village nearby - about 15 minutes west of Cocoa Beach across the 520 Cocoa Beach Causeway Intercostal waterway bridge. History Buffs will enjoy just walking around and looking at the Cocoa Village Victorian buildings and checking out small specialty shops. Cocoa Villiage is a fun Florida Cocoa beaches shopping area with some interesting Historic Buildings. See History and pictures plus a directory of shops and a map at the Cocoa Village Web Site. Tip 1 - There is ample free parking in Cocoa Villiage 1 block west of the "Main Drag" running North-South - Brevard Ave. -- off of Florida Avenue. Tip 2 - Check out interesting Murdock's Bistro Restaurant at 600 Brevard Ave in Cocoa Villiage for lunch - our Cocoa Village Restaurant Top Pick -- plus a nearby "on the River" Cocoa Restaurant favorite just south of Cocoa down Hwy 1. Melbourne, FL - Also fun shopping and browsing in historic area of Downtown Melbourne -- nearby to south. Speciality shops, art studios, antiques, and small restaurants. Plus interesting historic architecture. Melbourne is about 20 minutes south of Cocoa Beach - or about 10 minutes South from Satellite Beach. Tip 1 May be able to see some manatees playing at nearby Viewing Pavilion at Crane Creek Promenade on south edge of shopping area. For Broadbanders, here is a short Underwater Manatee Movie. Tip 2 Some great Melbourne area Restaurant choices on our Waterfront Melbourne Florida Restaurant Top Pick page - "Reviews" - Pictures - Tips. Melbourne Tip 3 Nearby Airport - Melbourne International Airport - is only 8 miles southwest of Satellite Beach, FL. It is a newer, clean, "peaceful" Airport that Delta, NorthWest, American, and US Airways now fly into. Melbourne Airport is about 19 miles southwest of Cocoa Beach, FL, so it is very convenient - and has much shorter check-in lines than Orlando International!!! Check out current Air Fares into Melbourne (MLB) to see if is worth paying a few dollars more for the convenience and to miss the conjestion and waiting time of big Orlando International! Several Major Car Rental Companies are inside the spacious newer Terminal. Usually Orlando Air Fares are a bit less, but sometimes the fare into Melbourne Vs Orlando (MCO) is almost the same -- occasionally Delta is even a bit less. BIG Tip!! - Florida Airline / Rental Car Travel Tip - could be a BIG Money Saving Tip depending on your itinerary -- Recently discovered from Delta Airlines that Delta and most other airlines will currently let you fly INTO one City in Florida and OUT OF another City in Florida and count it rate wise as a Regular Round Trip due to there being so much vacation travel into and out of Florida. Really good news is that most Car Rental Companies now use the same rule! -- you can pick up car at one location in Florida and drop off at another in Florida and get "return to same location" lower rates. BIG help! For example, we recently were able to fly into Jacksonville, FL and rent a car to start trip with 3 days in nearby St. Augustine, FL -- and then return the Rental car to Melbourne, FL airport where we flew out of after our week stay at a nearby Cocoa Beach Condo -- all at "Round Trip" Rates! Check it out on your next Florida Vacation! Ron Jon Surf Shop - At north end of Cocoa Beach at 4151 Atlantic Avenue (also Hwy A1A). World famous large 2 acre shop with all kinds of swimwear, sportswear, and beach gear for all ages. Open 24 hours a day 365 days a year. A popular Florida Cocoa Beaches shopping trip. Share your own Florida Cocoa Beaches Area Favorite Attraction Comments, "Rave," or "Review" on This Favorite Cocoa Beach Attraction Page. You Might be a Winner in the Contest! If you need something from a large shopping center or want to go to a Movie, go to Merritt Square Mall (+ 16 Movie Theaters) on Merritt Island - on south side of SR 520 shortly after you come off of the last causeway bridge. Dillards, Burdines, Sears, and JC Penneys plus many specialty shops. There are over a dozen restaurants at the Merritt Square Mall - and the Cobb Merritt Square 16 Movie Theaters & IMAX - some located on the south side of the shopping center, and some along the south edge of the shopping center parking lot. If you or the kids decide to take in a movie after dark some evening when you are not watching for Turtles, this link goes to what's playing at the 16 theaters -- or call 321-459-3737 for info. Scroll down on the page for a Link to a printable map.
. . . the best easy to read local Map of the Cocoa - Satellite Beach area and the Inter-Costal Waterway Causeway Bridges + Attraction locations available! Also many Florida Cocoa Beaches area Discount Coupons. Our "Top Pick" Florida Cocoa Beaches Guide Book - Great resource! Includes reviews on Florida beaches + Attraction ratings and rankings by age group. Please send us any good Florida Cocoa beaches points of interest or Attractions which you have discovered that are not mentioned here. Also send your favorite Cape Canaveral Space Center (Cape Kennedy) pictures. You can send Comments to us on our Your Top Picks & Comments Page. Thanks! Florida St. Augustine Attractions Day Trip - to "Must Sees," Tips, and Pictures. Cocoa Beach Vacation Resort Rental Reviews + Timeshare Exchange, or Owner/User Experiences and Reviews + "Raves" and "Rants". You also can see the Florida Cocoa Beaches Resort Reviews from others of our Site Viewers. Top Pick Live Cocoa Beach Web Cams - even some Live Interactive "controllable" Cocoa Beach Webcams with continuous images. - a taste of being at Florica Cocoa Beaches!